Despite a bracing chill and a rather arduous 2.3-mile course for the fifth annual Walk Don't Destroy fundraiser yesterday, Develop Don't Destroy Brooklyn (DDDB) attracted about as large a crowd--at least 160 people--as it did last year, though the fundraising total--more than $40,000--was down a bit from the $45,000 last year. Buoyed by a Chicago-based marching band called Environmental Encroachment, the walkathon also included some very 2009 creative elements: bilingual signs in Russian and English (above), a reference to the recent agreement by Russian billionaire Mikhail Prokhorov to purchase 80% of the Nets, and a postcard handout, using the graphic style of Mayor Mike Bloomberg's re-election campaign, challenging his position on Atlantic Yards. 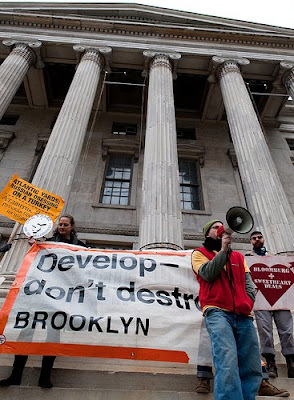 Some observers, including myself, had wondered last year whether there would be any need for a fifth walkathon, given that the legal fight against Atlantic Yards, likely would be over, but that's clearly not the case. The eminent domain case is pending in the Court of Appeals, with a resolution expected next month, a new case against the Metropolitan Transportation Authority was filed last week, and, just yesterday, DDDB spokesman Daniel Goldstein (at right in photo above, with, from left, actor John Turturro, Park Slope architect Gilly Youner, and City Council Member Letitia James) announced that another lawsuit, regarding the project's environmental review, would be filed on Monday. Still, given that Goldstein and others described the project as being in an "end game," it would be surprising to me--and a sign of successful community resistance--if there's a sixth walkathon next October. This time the walkathon attracted a somewhat larger number of recent/current political candidates--indicating that the opposition to the project has broadened--though no more elected officials. James was the only elected official present at either the walk or the after-party at Habana Outpost in Fort Greene. Others--all Democrats, unless indicated--included 33rd Council District candidates Ken Baer, Ken Diamondstone, and Jo Anne Simon; 39th Council District candidates Josh Skaller and David Pechefsky (Green); 36th Council District candidate Mark Winston Griffith (WFP); 10th Congressional District candidate Kevin Powell; Senatorial candidate Jonathan Tasini; and mayoral candidate Rev. Billy Talen (Green). Talen (left) spoke--or, rather, preached--during a planned stop outside Mayor Mike Bloomberg's campaign office on Atlantic Avenue. 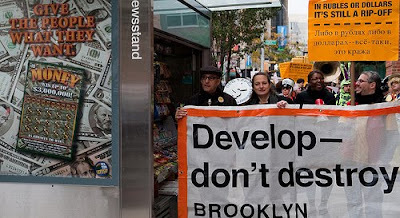 While he has expressed strong opposition to Bloomberg's megadevelopments, criticizing the use of eminent domain and invoking Jane Jacobs, not everyone in the group was supporting him; James, a loyal Democrat, wore a button endorsing Democratic nominee Comptroller Bill Thompson. While a decent cross-section of Brooklynites passing the walkathon by foot or vehicle saluted the marchers, a few passers-by made the inevitable comment that the group was mostly white rather than fully reflecting the diversity of the neighborhoods around the project. 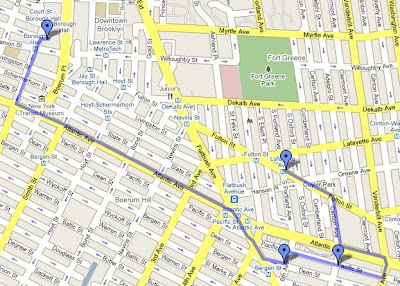 The group gathered on the north side of Borough Hall before walking down to Atlantic Avenue, east to the corner of Flatbush Avenue, and then through the Atlantic Yards footprint--along Dean and Pacific streets--before finishing in Fort Greene. "Now we need to go to Russia," riposted someone in the crowd. "Moscow next, if we need to," Goldstein responded. Turturro, an actor, writer, and director living in Park Slope, was the event's celebrity guest. In his remarks, he focused on traffic. "I know how hard it is to cross Atlantic Avenue and Flatbush Avenue at 4 or 5 in the afternoon," he said. "I can only imagine, with a sports arena there what the traffic problem will be." Turturro said there'd be no affordable housing in the project any more; that's not true, given that state officials say that at least one residential tower would be built at first, but there are certainly questions about the commitment to 2250 subsidized units. He was on firmer ground in criticizing traffic: "We know, when there's one car double-parked in front of Junior's [on Flatbush Avenue], there's a traffic emergency." In the video below, Goldstein explains that "we're not litigious people, normally. Everyone understands that it's only when government keeps its head in the sand, when the mayor does, when the governor does... that's why we are in court. Because they don't listen." In the video below, the parade leaves Borough Hall and heads for Atlantic Avenue. "This brings us together and provides affordable housing and real jobs," James declared outside a display explaining the UNITY Plan for the Vanderbilt Yard, which would divide the railyard into multiple parcels for bidding. There was some inconsistency in her message, however, given that the UNITY Plan would involve significant density--though not as much as Atlantic Yards--and she had earlier saluted the brownstone scale of Brooklyn. 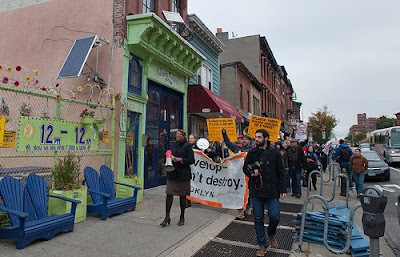 Outside Bloomberg's campaign office, the group (below) chanted "Eight is enough." One of the speakers, lawyer, urban planner, and Noticing New York blogger Michael D.D. White (left) reprised his commentary--first made during City Council testimony last year--at a Friday event on term limits organized by Thompson, cited in Saturday's New York Times for its sly effort to change the rules in the middle of the game, just as Bloomberg did. "What's the message we need to send Mr. Bloomberg?" White asked rhetorically. "He needs to learn his limits." Below, members of the group chant "Eight is enough," referring to the eight years of Bloomberg's two terms. 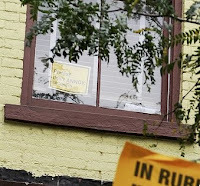 Interestingly, a sly and subtle bit of counter-protest, someone in the Bloomberg campaign office--or maybe just the folks upstairs--put together a sign aping DDDB's graphics with the message "Protest--don't annoy." "I am tired of this. I want it to be over," Skaller said. "It's been too long we've been asking our elected officials to stand with the people they were supposed to represent." Nergis Irani, an activist in India and Goldstein's mother-in-law, offered a brief message: "Never give up. We didn't give up and we have won. Because integrity and truth always prevail." I'm not sure how much the parade contributed to the traffic slowdown. As the group turned east off Flatbush Avenue along Dean Street, several empty lots--created after buildings inside the Atlantic Yards footprint were demolished by Forest City Ratner--presented themselves. At one point on Dean Street, a resident of one of the remaining buildings stepped out from the group to pose for pictures on the the building's stoop. Outside Freddy's Bar & Backroom, at the corner of Sixth Avenue and Dean Street, musician and Fans for Fair Play blogger Scott M.X. Turner (below) asserts that the bar--slated to be demolished for the Atlantic Yards project--represents the opposite of what Bloomberg and Borough President Marty Markowitz want for Brooklyn. The group passes the Community Liaison Office set up by Forest City Ratner at the Spalding Building at the corner of Sixth Avenue and Pacific Street. Perhaps the eeriest stretch of the walk was along Pacific Street between Carlton and Vanderbilt avenues, dominated by an empty lot created after the Ward Bakery was leveled. The block is slated to become the site of interim surface parking for the arena, with room for more than a thousand cars. As photographer Collins has pointed out, the parking lot would be bookended by the Prospect Heights Historic District. James speaks outside some apartments on Pacific Street slated for demolition. 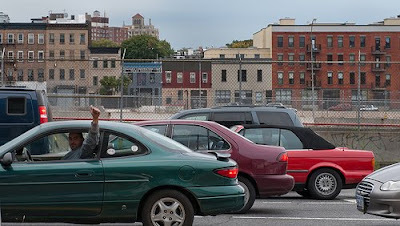 As the group walked west along Atlantic Avenue, with the Vanderbilt Yard and the mostly-empty Ward Bakery block below it, a driver indicated support. The group arrives at Habana Outpost on Fulton Street in Fort Greene. Great coverage! I regret I couldn't be there. But my support is 100%. Very strange why our politician are so absent. Eva.... because they all want BUMberg's money, and they are afraid to oppose him. All, of course, except the courageous Letitia James.